Properties in Leiria District average 4.6 out of 5 stars. Bernardo was very helpful. (He even got my car out of a ditch the night we arrived!) 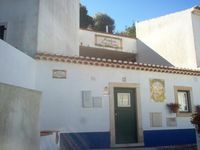 We selected this property because of its convenient access to the towns on the western end of the Algarve. The property was very nice and the cottage was clean and well kept. Good value for the money. Great location to walk in &Oacute;bidos. Comfortable bed. Good shower. Manuela picked us up from the train station. A bit dark and damp, but the dehumidifier and electric heater took cate of that. Lovely complimentary drink of Ginja.